One week ago, moments after her boyfriend Philando Castile was shot by a police officer during a routine traffic stop, Diamond Reynolds flipped on Facebook’s live streaming feature. The resultant video, with Reynolds documenting what had happened, as well as her interaction with the police officer, immediately started to spread like wildfire. When asked why the video had temporarily disappeared, Facebook simply said “It was down to a technical glitch.” The company had no further comment on the matter. One needn’t travel far on the Internet to find a think piece bemoaning how Facebook has destroyed journalism, with a whiff of nostalgia for a time when The New York Times decided what news was fit to print and Walter Cronkite declared nightly “That’s the way it is.” It’s a viewpoint that is problematic in two regards. First, the destruction of journalism is about the destruction of journalism’s business model, which was predicated on scarcity. In the case of newspapers, printing presses, delivery trucks, and a healthy subscriber base made them the lowest common denominator when it came to advertising, right down to four line classified ads that represented some of the most expensive copy on a per-letter basis in the world. In explaining the conclusion that its fairness rules were “no longer necessary to achieve diversity of viewpoint,” Ms. Killory, the commission’s counsel, noted the major growth of broadcast outlets in recent years. There are now more than 1,300 television stations and more than 10,000 radio stations in the United States — in contrast to 1,700 daily newspapers — and 95 percent of viewers receive five or more television signals. Radio listeners in the biggest 25 markets receive an average of 59 radio stations. Two decades later the average American home received 189 TV channels, and thanks to the Internet, an effectively infinite number of news websites. Scarcity was gone, and the publishing bubble is popping as a result. That Facebook has been the most effective service in collecting and funneling attention to the abundance of news on the Internet is a separate story. More importantly, the nostalgia for a world of journalistic gatekeepers is nostalgia for a world where the death of Philando Castile would be little more than a one paragraph snippet in the Minneapolis Star Tribune that would have sounded a lot like the initial police report that dryly noted “shots were fired”, and that would have been that. Those old business models were great for journalists; they weren’t so great for those not deemed worth covering. Those nostalgic for the “good old days” are likely wishing for far more problems than they realize. Just the other week I saw a live video of a woman and her kids skiing down a hill. It was just mesmerizing! I watched it for a few minutes because I was like ‘I just want to make sure these kids get down this hill.’ There’s usually people who are playing music or dancing in there, but every once in a while there’s something that is really important and special happening. Like a couple of days ago a woman named Lena commented on one of my posts to tell me that when her mother was sick in the hospital she streamed her wedding on live so her mother and her friends across the country could not only see it but could be there with them. Now that’s pretty meaningful. Raw, visceral, meaningful. That’s a pretty good way of describing Reynolds’ video. Newsworthy is another, and that’s where things get a whole lot more complicated for Facebook. I noted above that Facebook is not necessarily to blame for the destruction of journalism’s business model, but with live video the social network has moved from feasting on what remains of publishing to becoming a journalistic company in their own right: Facebook’s 1.6 billion users have been deputized to not only chronicle their ski trips and weddings but also killings by police and, a day later, the killings of police. One recent trend in social media has been a move away from highly produced content, particularly video…This is precisely what Snapchat is so good at, and why it has become such a threat to Facebook. And it’s clearly something that’s been on Zuckerberg’s mind as well. I wrote after this year’s F8 about how Facebook from the very beginning had always been about projecting your best self online; given that, I wondered if the focus on Live Video might ultimately prove to be a distraction from what Facebook was good at (owning identity online). This last week is validating that concern in a far more profound way than I appreciated. The risk is this: Facebook’s control over what the vast majority of people see online — news included — is overwhelming. Before the advent of Live Video, though, Facebook could more easily claim to be a neutral provider, simply serving up 3rd-party stories via an allegedly objective algorithm that was ultimately directed by the user itself, and using that user direction to build the best identity repository in the world to sell ads against. And while the reality of Facebook’s News Feed is in fact not objective at all — algorithms are designed by people — actually creating the news will, I suspect, change the conversation about Facebook’s journalistic role in a way that the company may not like. We do not believe, however, that the licensee’s obligations to serve the public interest can be met merely through the adoption of a general policy of not refusing to broadcast opposing views where a demand is made of the station for broadcast time. If, as we believe to be the case, the public interest is best served in a democracy through the ability of the people to hear expositions of the various positions taken by responsible groups and individuals on particular topics and to choose between them, it is evident that broadcast licensees have an affirmative duty generally to encourage and implement the broadcast of all sides of controversial public issues over their facilities, over and beyond their obligation to make available on demand opportunities for the expression of opposing views. It is clear that any approximation of fairness in the presentation of any controversy will be difficult if not impossible of achievement unless the licensee plays a conscious and positive role in bringing about balanced presentation of the opposing viewpoints. Facebook is not a broadcaster: they don’t depend on a government-granted monopoly over radio frequencies that comes with strings attached. And frankly, even were I inclined to agree that the end of the Fairness Doctrine contributed in some way to the United States’ increased polarization, the clear free speech issues inherent in its application, combined with the explosion in media outlets, lead me to believe the FCC was right to revoke it. That said, Facebook’s influence over what most people see quite clearly rivals that of television broadcasters circa 1949, and the vast majority of jurisdictions in which Facebook operates have much less absolute free speech laws than the United States. The more that Facebook is perceived as a media entity, not simply a neutral platform, the more likely it is that the company will face calls for regulation of the News Feed in particular, in language that will likely sound a lot like the Fairness Doctrine. You may think this is problematic for society (as I do), but at least Facebook is being honest about it; transparency is the company’s best tool to remain free of regulation. It’s also why the “technical glitch” was so disappointing. 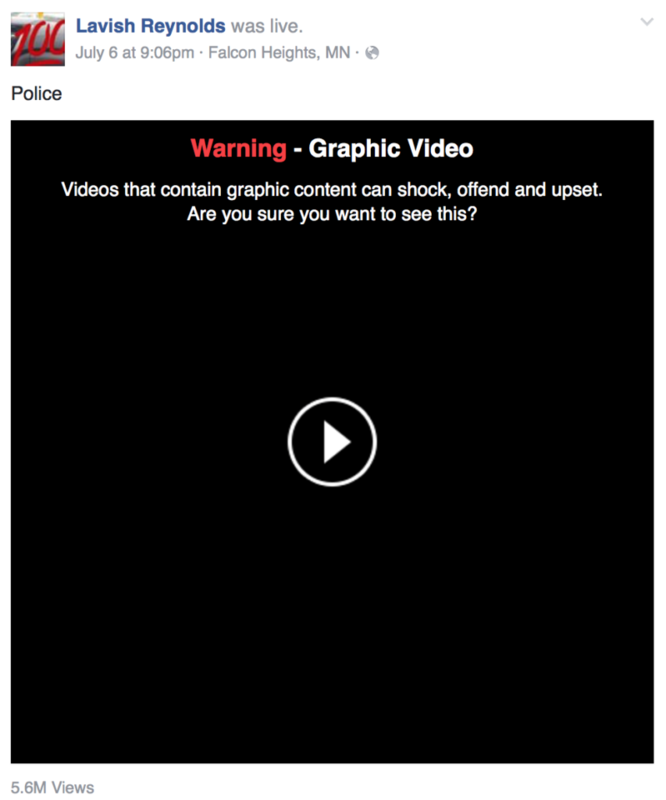 The reasons why Reynolds’ video was taken down are probably innocuous — I suspect the video was flagged for graphic content by a Facebook user and removed by a contracted content reviewer (like these in the Philippines), and then restored by someone at Facebook headquarters — and the company is probably both embarrassed that it happened and shy about revealing the degree to which it farms out content review. The most powerful journalistic entity in the world, though, doesn’t get the luxury of sweeping such significant editorial decisions under the rug: that rug will be pulled back at some point, and it would be far better for society and for Facebook were they to do so themselves. One thing is for sure: this won’t be the last time something truly raw, visceral, and meaningful happens on Facebook Live. Zuckerberg has gotten his wish, even if the implications will ultimately be more than he bargained for: all of the eyes on those live videos will only increase the number of eyes on Facebook itself. It’s a classic case of unintended consequences: Facebook’s attempt to capture Snapchat’s private gestalt has only solidified its position as a public platform with the added component of a newsmaker in its own right, and while that carries clear benefits for society, society will expect more transparency from Facebook, willingly delivered or not.